Gulf Stormy Skies. Our favorite beach, Cape San Blas, has gorgeous sunsets. This one was threatening, yet still beautiful. Winter in Georgia is wet, brown, and muddy. Not much inspiration to paint. But when I received this Amaryllis bulb as a Christmas gift, I couldn’t wait to see what it would produce. The bloom was huge and leaves spiky. My favorite flowers, yet this time in a still life setting reminiscent of Van Gogh’s famous “Sunflowers” painting. Art waits for no one. I snapped as many photos as I could, and have painted this scene countless times as well as made an award-winning art quilt from it. Another version of my Mother’s Day tulips, painted in an impressionist style. This painting is much softer than the original one with darker, deeper colors. 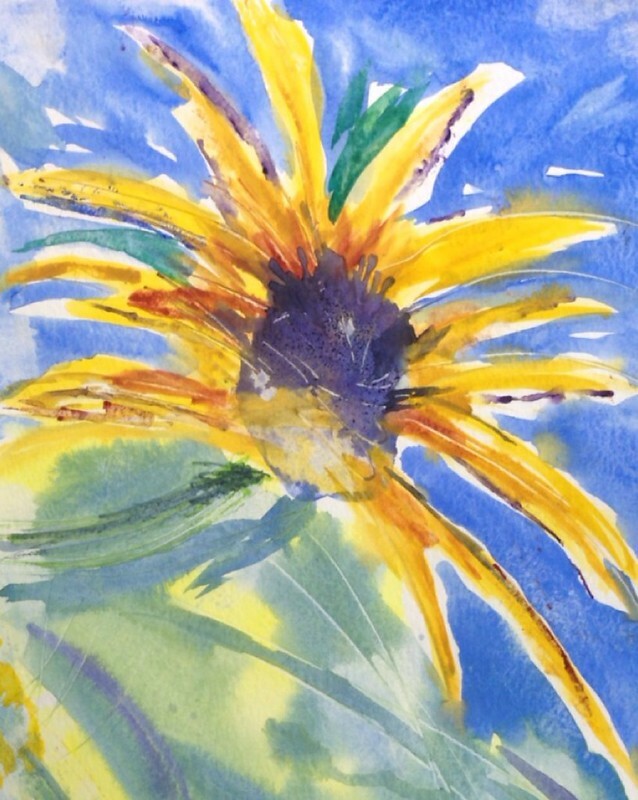 In late August, nearby farms are resplendent with statuesque sunflowers. They are my favorite flowers to paint, and this one was so tall I knew it would end up in one of my paintings. My husband gave me these tulips for Mother’s day. I placed in my one of my favorite vases, found from all places, Ebay. Tulips have such a strong, yet delicate form. They don’t grow well in Georgia, so I buy them from my local grocery store or paint the ones my husband so lovingly gifts to me. This is one of my favorite vases: it has lovely scallops around the top, and graceful curves on the handle. I bought it, from all places, on Ebay. One person’s trash is truly another’s treasure.